1/2" Capacity 1/4" Bsp Entry..
1/2" Drive Torque = 34-422 N Air Consumption = 3.8 - 15 CFM Speed = 4 Forward 1 Reverse RPM = 74..
Square Drive - 1/2" Socket retainer - Friction ring Working torque - 102-310 ft-ibs (138-420Nm) T.. Ultimate Torque @ 90 PSI Patented Spring Hammer Clutch Provides Smooth operation and Extreme Durabi..
Max Supply Pressure - 10 Bar Connection - 1/4" BSP Female Air Flow - 270 L/min / 9.3 cfm.. Die grinder as per code 116100L Set of tungsten carbide rotary burrs in mini-box includes: 2 x T.. Brand = Delco Capacity = 6mm RPM = 22000 Air Consumption = 3.5 Cfm Air Inlet = 1/4" Bsp Air Pre..
RPM = 4000 Capacity = 1/4" Collet.. Speed - 25,000rpm air consumption - 113L/min Total length - 251mm Weight - 0.9kg Noise level - 7..
Air consumption - 113l/min Total length - 156mm Weight - .57kg Noise level - 77 dBA Rec air pres..
Extended Shank Provides Easy Access into Tight Spaces Ideal for Grinding, Deburring, Edge-Breaking ..
Brushes can be used with all types of Paints, Thinners and Spray Gun Cleaning Solvents Ideal for Cl..
3/8" Drive 1/4" Bsp Entry.. Maximum pressure - 90psi (6.2 bar) Includes 1 blade.. 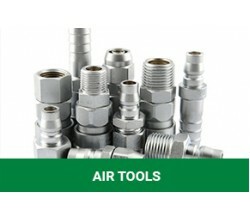 Supplied with 2 blades Supply tool with 90 psig of clean dry air. Please note higher pressure appli.. Powerful Reduced vibration Economical 3200 bpm Kit includes: Hammer, 4 chisels, retainer.. Available to retract drill bit reversely after drilling through the hole Convenient forward / rever..
Air consumption - 113L/min Total length - 185mm Weight - 1.1kg Noise level - 83dBA Air pressure ..
Economy Capacity 3/32" - 3/16"..
Air Riveter up to 3/16"
For fast and accurate fixing of pop rivets Simple trigger operation. Capacity - Steel rivets up to.. Regulate Pressure - 10 - 120 Psi Max Pressure - .. Suitable for Inflating Bicycle Tyres, Water Rafts, Pool Toys, Athletic Equipment, Air Mattresses and.. Suitable for based paints Complete with internal air regulator, spanner, filter & cleaning brush ..
Impact Wrench Long Reach 1/2"
Socket - friction ring Working torque - 28-440 ft-ibs (37-596Nm) Max torque - 560 ft-ins (758Nm) ..
-Heavy Duty cast iron paint pot -8m hoses -Spray gun, regulator & fittings -Ready to use out of t..
-Anti-kink coiled hose -Plastic sealed -Sprung ends -Complete with standard fittings..
PCL 100 Series Integral Hose Tailpiece 1/2"